Early in his career, Presley was publicly shy and self-conscious, sometimes questioning his purpose in life. Live mics made him tongue-tied and nervous. Still, he loved a good time and he had more than his share of girlfriends, including one who wanted to marry him and one who definitely did not. Unfailingly polite, Presley was respectful of his elders (even two-years-older-elders), and was complimentary to fellow musicians and kind to fans. He loved to read the Bible and he carried the New Testament with him in a traveling box, which also held jewelry he impulsively bought as gifts. “Sweet,” in fact, is a word used often in this book. “Nice” is another and that didn’t change as Presley’s career grew. Never taking on airs, he was, “plain as a shoe” but fame had its price, even so: friends had to disguise Presley so he could enjoy everyday pleasures like restaurants and nightclubs. It’s maybe hard to tell by the photo you’re looking at here, but that’s fringe on the edge of “Blue Suede Shoes.” It’s gaudy, like an old Las Vegas showgirl costume, perhaps the kitschiest book you’d have on your shelf, but if you loved Elvis Presley, it’d be the most popular one, too. And what’s between those blue faux-suede-fabric covers? Interviews, of course: author Thom Gilbert spoke with musicians who worked with Presley, as well as co-stars, body guards, love interests and others. But that’s not all: readers will find pages absolutely packed with photos of things Elvis owned, gave away, lived in, wore, treasured and used throughout his career. Beware, though: despite the uniqueness and abundance of memories here, it cannot be said that this is a wide-arcing book. That’s OK; it has the feel of a lush secret that’s whispered from the dressing room of a smoky casino. Who could resist? Fans can’t, that’s for sure. 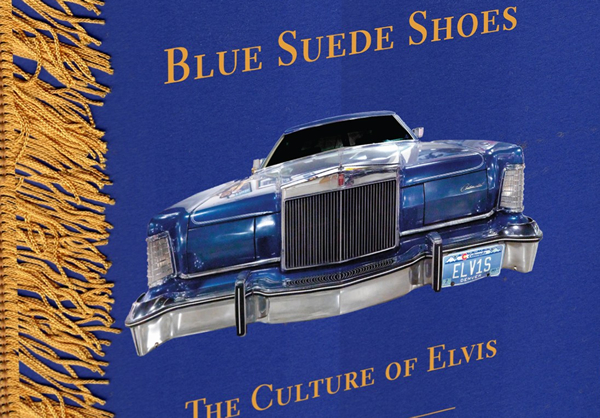 This book may be pricey, but you’ll know “Blue Suede Shoes” is worth it once you take a quick peek inside. If you’re a die-hard Elvis aficionado, you “Can’t Help Falling in Love” with this book.